The Hugging Home: Bacon is Funny!!! Not too long ago I posted something on Facebook. It was actually something that I had seen someone else post and it has made me laugh, and seeing I was sick and not in the best of moods, I decided to post it myself. Well...it certainly succeeded in making me chuckle...and some other people as well along the way. I feel like crap but just read something that made me laugh. It's called The Bacon Game. Think of a TV show name then replace one word with "bacon". Then add below as a comment. Funny, right? Well...including my own (which were substantial! ), I ended up with over 250 comments - and counting. Some were repeats...but they all proved one thing: Bacon - for a reason I can't quite explain - is funny! I decided to post the comments in hopes of making you smile too! Here they are! Whose Bacon Is It Anyway? 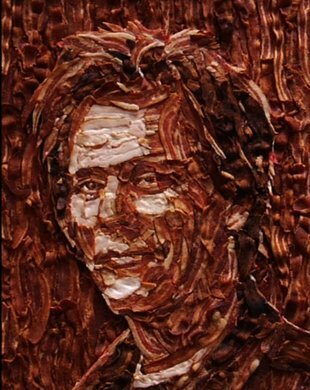 Who Wants To Be A Bacon-aire? 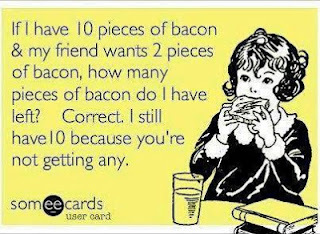 Are You Smarter Than A 5th Bacon? 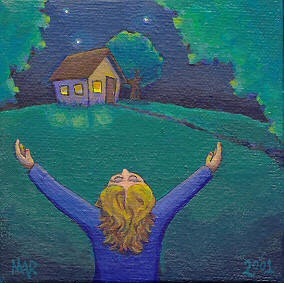 Thanks to my Facebook friends who participated in this fun little activity! 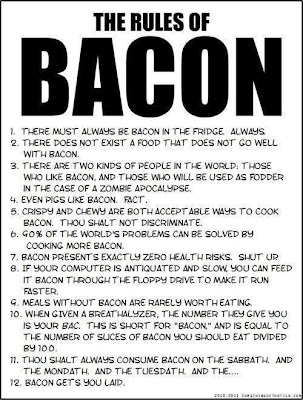 As an FYI...here are "The Rules of Bacon" - as if you don't already know them! And obviously this could go on and on...and so go for it! Feel free to leave your funny "Bacon Show" in a comment below. Once you have completed the research, it is a cakewalk after that. So what really makes people like these funny articles and funny news stories? It's simple!